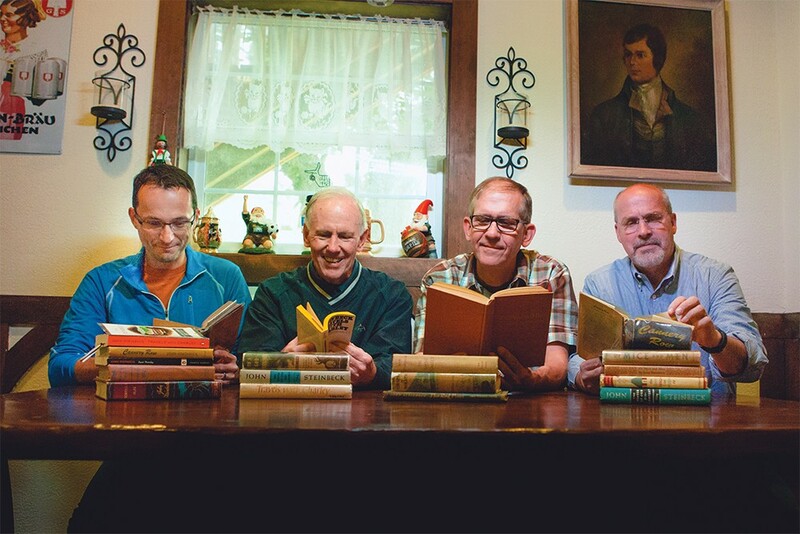 Members of Tiger Ray's Wine and Book Club (from left): Paul Warfield, Bob Delaney, Jim Anderson and Bill Long. When Amy McCaffree's children were transitioning from toddlerhood to preschool, she suddenly found that she felt isolated in this new life stage. "I just wanted to have time with other like-minded friends in the evening," she says. A lifelong reader, she decided to form a book club. The group became something to look forward to in the midst of a time where she felt mostly alone in unfamiliar territory. "I knew I needed something for my own mental and emotional health, especially because I worked from home," says McCaffree. "I needed more interaction with cool people, basically." McCaffree found other mothers who were in her same boat, and they took advantage of the book club bookbags offered through both library systems. Each bag contains multiple copies of a book, a discussion guide, and tips for running your own book club. It was the perfect solution for a group of busy moms. Although McCaffree's group is no longer active, she credits it with getting her through those difficult mothering years. "I knew I had commitment from people to gather monthly, and there was sort of this kindred comfort knowing that this group of women was all reading the same book," she says. "Then, as we saw each other in the midst of reading, we'd say, 'Well, did you get to that part?' So that just sort of gave us this camaraderie — whether it was fascinating nonfiction or interesting characters, and a theme of a novel." Jim Anderson has been a part of his book club for nine years. Known fondly as Tiger Ray's Wine and Book Club (named for a founding member who is now deceased), Anderson calls it a drinking club with a reading problem. But there's far more to it than that. "We love John Steinbeck; we've read 10 to date, and there's a few more we have to get to," says Anderson. "I counted up our list. Since we've started, we are up to about 90 books now. A little bit of everything." For Anderson, the books are great, but the friendships are the real draw. These men have come to know each other's stories. "We all trust each other, so we can kind of share more personally than we would with a lot of other groups of people." Each member of Anderson's group takes turns hosting, providing dinner, and choosing the book, on rotation. For Ashley McGowan, book club is a way to stay connected with friends near and far. She and three friends meet together each week using a videoconference, and discuss a few more chapters of whatever book they are reading. Although it takes place entirely online, it's a link to a regular connection with friends she treasures. Perhaps one of the reasons that reading communally makes sense is that it was the norm until very recently, notes Jenny Brown, professor of French at Whitworth University, member of three book clubs, and author of a book blog called "Shelf Love." "Literature has not been a solitary pursuit for very long, really only since the 19th century," says Brown. "People used to read books out loud to each other — it used to be a completely oral pursuit for almost the entire history of literature. The first literature was totally oral, because it wasn't written down at all, and then it was a read-aloud pursuit all the way through the 18th century. The idea that we would sit by ourselves and read only goes back to the time when people were literate. "One of the things," she adds, "that I think is absolutely crucial about books is being able to share them with other people to get the full experience out of them. Obviously, reading by yourself is a wonderful thing, but one of the things that is most enjoyable about reading is being able to say, 'What did you think about this?' and get somebody else's opinion, even if it's just sharing the pleasure of it." As an educator, she's also noticed that it enhances learning. Students pick up more when they hear insights from other people. Gwendolyn Haley, library services manager for the Spokane County Library District, notes that adults need to read just as much as kids do: "We talk about this a lot, that kids need to read a diverse range of books because they need both mirrors to reflect themselves, but also windows to let them view other lives, other places, other ideas." Talking about these ideas civilly, in a book club setting, gives everyone tools for expressing themselves in an articulate way, and often expands personal empathy for another perspective. Borrow a Book-Club-To-Go kit from your local library. 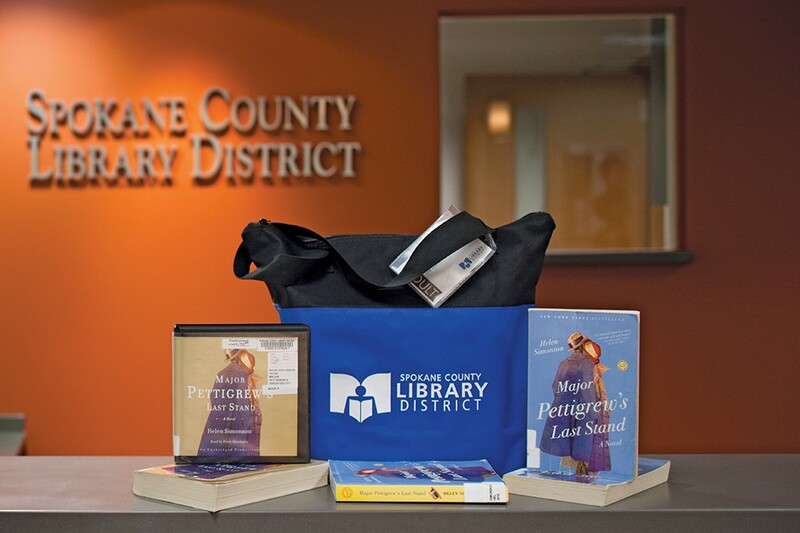 • Gather up some friends and check out a book club bag at Spokane Public Libraries. • Spokane County Library will help you "incubate" a new book group in one of their libraries, and offers workshops dedicated to helping you get started. • Auntie's Bookstore, 402 W. Main, offers a variety of book groups; learn more at auntiesbooks.com. This fall will mark the 16th straight year of Spokane is Reading, a collaboration between Auntie's Bookstore, and the Spokane Public and Spokane County Library systems. Each year, a committee of representatives from each entity comes together to begin the difficult task of selecting the book. "We try to find a book that will appeal to a wide variety of people," says Eva Silverstone, outreach liaison for the Downtown Library and Spokane Is Reading committee member. They begin with a large list, made up of recommendations from friends and colleagues, as well as suggestions from people who have attended the event in the past. Beyond the plot, characters, and writing style of the book, the committee is weighing the expense of bringing in an author, as well as whether the book is in paperback (so that people who wish to buy, rather than borrow, have a less expensive option). 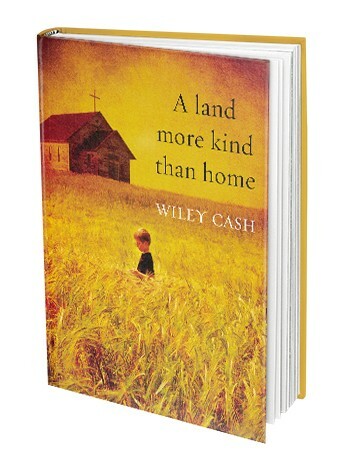 This year, the book is A Land More Kind Than Home, by Wiley Cash. "I feel like we have an interesting setting, really interesting characters, I thought it was well written, and the plot is very interesting as well," says Silverstone. "It definitely took me out of my own personal sphere of knowledge — I felt like I learned about people and place that I wouldn't normally come across. That broadens me." Each year, the author of the book selected for Spokane is Reading makes an appearance. "One of the things that hooks into the event is that there are book clubs at the library, both [at Spokane County] and Spokane Public, and at Auntie's, that you can talk about the book before the author comes, and sometimes even after the author comes," says Erin Dodge, communication specialist for Spokane County Library District and Spokane Is Reading committee member. "I think what is interesting about a community-wide read is that if you have nothing to talk about, and you're meeting somebody for the first time, you can say, 'Have you heard of Spokane Is Reading? Have you read A Land More Kind Than Home?' You could spark a conversation.," says Dodge. "Maybe not everybody in the community is reading it, but there are thousands of people reading the community-wide read, all different ages. That's really interesting, because you see at the readings, teenagers and grandparents and everybody in between, and they are all reading the same book — so they have another thing to talk about for connection." Meet Wiley Cash, author of this year's Spokane is Reading book, A Land More Kind Than Home, on Nov. 9: 1 pm at Spokane Valley Event Center, 10514 E. Sprague Ave; 7 pm at the Downtown Library, 906 W. Main. Both events are free and open to the public. Wondering what to read? We asked the sources for this article to weigh in on some of their top picks for book clubs. "It's a really interesting look into the life of a modern American woman, and what she's dealt with and had to struggle through. It was truly interesting, and some of the best writing I've read in a very long time." "Many consider this Steinbeck's masterpiece (along with The Grapes of Wrath). It's a retelling of the biblical Cain and Abel story, how choices shape our destiny, how we can choose good or evil. There is just so much packed in there, with such great characters." "I think her story is relatable to women on a lot of different levels, whether you've had loss and tremendous grief in your life, a troubled marriage, or just have done outdoor adventures that challenged you. It seemed like everyone in my book club fell in love with it. "I think every American should read this. It was written in 2010 and is still depressingly relevant. There's so much I didn't know, and I'm reasonably informed, but there was so much in that book that I didn't know already, and I would have a lot to discuss in a book club." "In my woman's book group, we had a great time discussing A Wrinkle in Time. Most of us hadn't read it since we were kids, and it holds up remarkably well for grown-ups. There are so many themes in there that are great to discuss, and a movie is coming out, so I think maybe that would be a really good book club book." "State of Wonder is one of my favorite books. It's about a scientist who goes down to the Amazon. There's a lot of really interesting conversation topics about Big Pharma, exploitation of cultures for the First World's gain, and it's beautifully written." "I'm a big fan of the author Kate Atkinson. The story is written with the main character living and dying probably 30 times in the book, but with slightly different things happening that cause her to either live longer or die earlier. I thought it was really fascinating." "The language is very visceral, and they are basically taking people off to concentration camps during the Holocaust, so it's a very riveting moment in history. There's a lot to talk about, and there's a lot of tension because somebody is hiding in the basement. There's a lot going on in that book, and it's relevant today." "One of the ones that I really loved and wanted to process with people was Midwives; there was just a lot there — it has to do with memory. Anything by Chris Bohjalian makes a great book club book."